Chalkidiki Flour Mills s.a represent and delivery to Greece, in Cyprus, in Balkan and Mediterranean countries products from ABDON MILLS Group and Schapfen Mühle Gmlh. Karin of Denmark s.a, Valsemollen s.a, FINAX and Kobia are a part of ABDON Mills group, the Scandinavian family-owned milling and food industrial group of companies. ABDON Mills operates in Europe and in the USA with main focus on processed cereals. Karin of Denmark s.a offers Europe's greatest variety of easy-to-use bread mixes. The effective bread improvers, primarily based on natural ingredients, give you added advantages. They base their products on the highest quality raw materials-and no unnecessary additives. Their specialty bread mixes contain natural ingredients, and all are tested and tasted to make sure that the end results will appeal to the customer as well as to the baker. FINAX is the leading supplier of gluten-free products to consumers in the Nordic countries. Kobia is one of the main suppliers of pastry products to bakeries and confectioneries in Scandinavian countries. 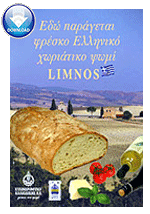 Chalkidiki flour mills s.a and ABDON MILLS group offer you an effective and profitable way to produce a great variety of delicious and natural Greek, Danish and International specialty breads - with good old-fashioned taste.